Transitioning from my One Mile Challenge to endurance-based training has resulted in a minor injury. I was therefore forced to take more rest days than I had planned. Still, this made me more determined and focused to gain the most from my limited training. The purpose of my first workout of the week on Monday (9 April) was to accumulate more miles at race pace*. Like last week the tempo threshold run was tougher than I had wanted it to be. Still, I ran 4x 1 mile at race pace with ¼ mile recovery jogs** in between. I knew that I needed to rest but because I coached in the evening, and the following two days, I knew I had to be sensible. As I often run to the start of my coaching sessions I found the extra effort resulted in increased pain in my lower legs. Although I was fully aware that rest was essential I decided to ignore it. This set my training back a couple of days. Therefore I learnt that a more sensible approach would have been to modify my own workouts to factor in extra, but less structured activity. On Sunday (15 April) I ran simply to stretch my legs and test my MTSS injury, which was made worse by the club run I committed to on Thursday (12 April). The club workout was 30x 30 seconds of fast pace running*** with 30 seconds of jogging recoveries in between. The high impact of running on the pavement did not support my training. Instead I realised that these faster workouts are not what I need in the build-up to my 10 mile race. So instead, on the last day of the week, I purposefully ran on grass, striking the ground with my mid-foot rather than forefoot. These modifications ensured that my leg muscles received a workout but without excessive stress. Psychologically, the run gave me confidence because I felt positive about my injury. Also, because there was less focus on maintaining a particular pace I could enjoy the countryside around me. During the week I ran 4.25 miles on Friday and 4.6 miles on Sunday at recovery pace** to build my endurance. My rest days were Tuesday, Wednesday and Saturday. My mile repeats on Monday and interval workout on Thursday amounted to 6.95 miles at race pace or quicker. * An appropriate pace range for me to support my race goal is 6:00-6:30 per mile. 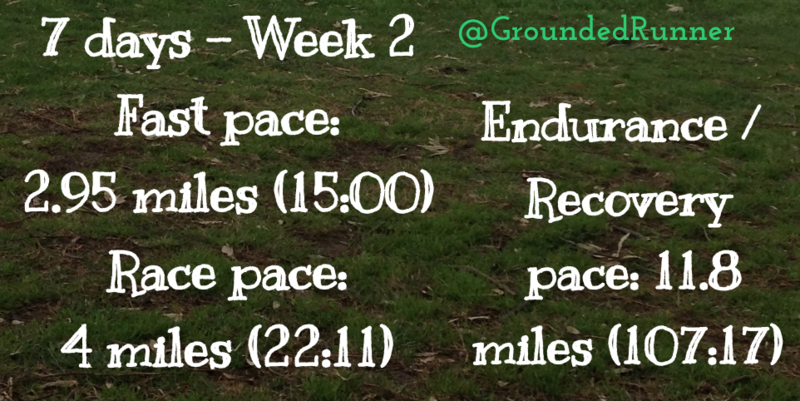 ** My recovery pace this week (including warm-up and cool down) is any pace slower than 8:50 per mile. *** Interval training for me this week is any pace faster than 5:30 per mile.